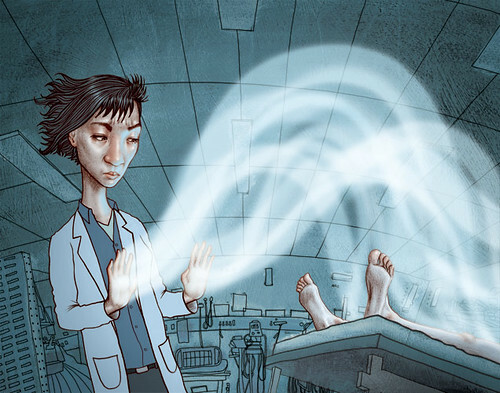 a spot illustration for The New Physician. the article talked a lot about empathizing with the patients. 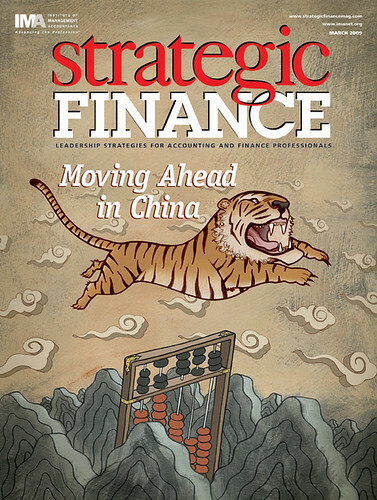 Cover for Practical Accountant. 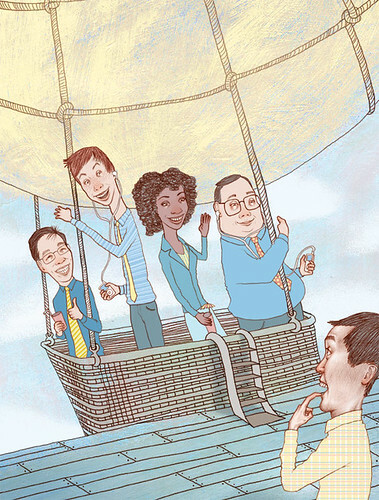 The feature story is about "Onboarding" new staff, meaning getting young people to join your company and stay there. 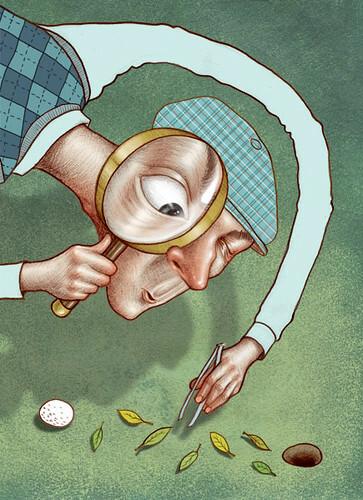 spot illo for the golf magazine rules column. this time it was asking if its ok to remove leaves from the line of putt. the answer was you can if you use the back of your hand only. 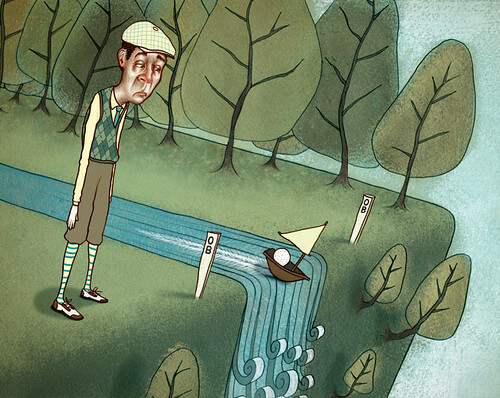 illo for the golf magazine rules column. this is saying you are out of luck if water like a stream carries your ball out of bounds. 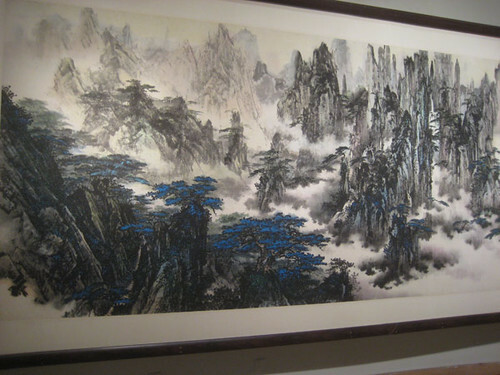 went back to the China national gallery because Zizzo wanted to go see the Joseph Turner Exhibition on loan from the Tate. No pics of the Joseph turner exhibit beacuse it was dark and they were really militant about taking photos. 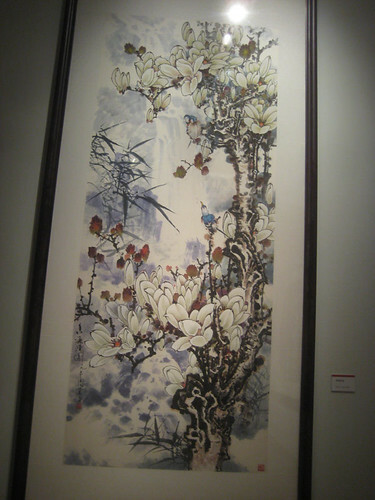 that doesn't mean i didnt take fotos but i found this chinese painter's stuff waaaaay more inspirational. 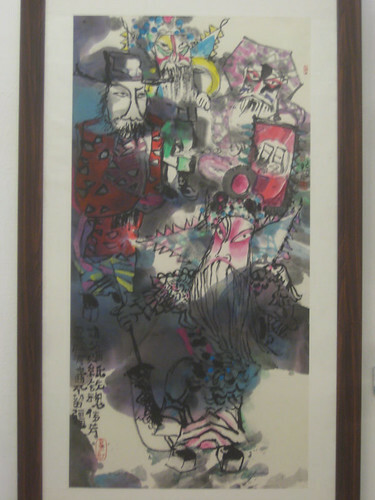 There were like at least 100 paintings by this guy. the guy is 69 and he looks pretty healthy so he looks like he has some more years of turning out these amazing paintings in him. 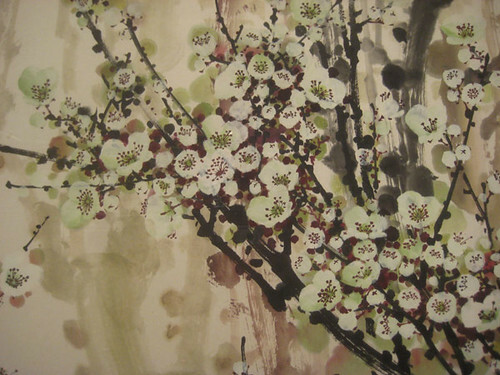 This style is the Xie Yi style of Chinese painting (black ink brushes, not really any lines). I am absolutely dumbstruck as an artist by this kind of stuff. I am looking for a way to incorporate it into my work. to give you a scale of how big this guy works. this was the biggest piece. the rest are either huge or really big. 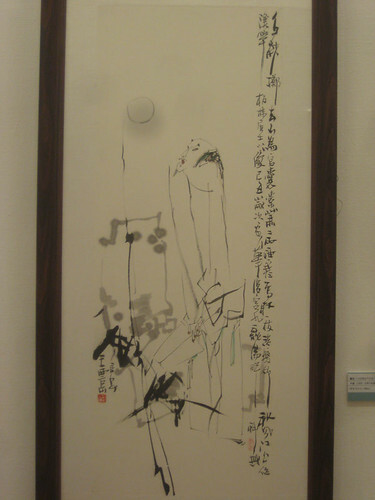 Xie Yi painting uses the white of the paper in combination with varying the amount of water and how diluted the inks are to achieve depth. that means if you F up its really bad. can you imagine how intimidating it would be to paint on this huuuuuge piece of paper that probably costs a fortune and had to be prepped and treated and soaked for days?!! 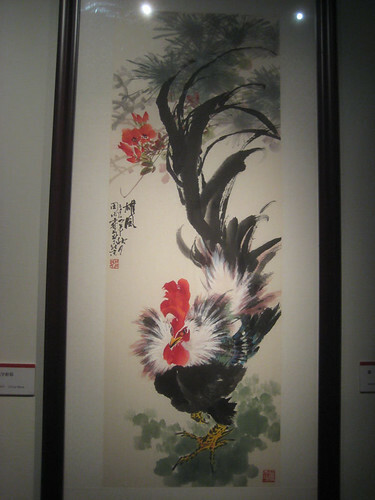 he had several differnt rooster paintings but this composition was the coolest. 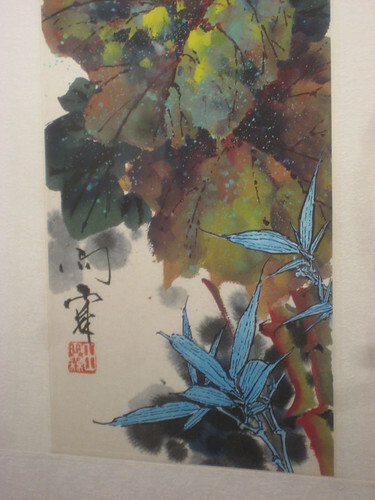 I like this guy because he mixed some gong bi hua elements in there (the lines on the flower petals) to create this brush strokey but at the same time graphic look. this one was the second biggest. look at all the white on there. 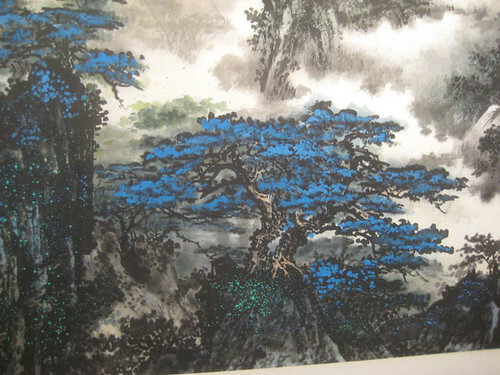 look at all the layering and differnt opacities of ink and paint. can you imagine painting on this? its like 10 feet long. by the time you get over to the 9 foot mark i would have soiled my daipers 20 times over from fear of a misplaced ink droplet or a smear. 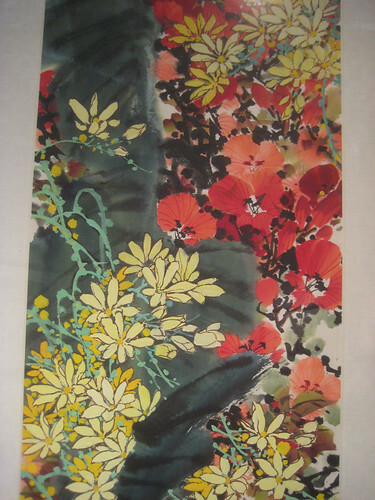 awesome topaz color used on this instead of green. a muted green on red color scheme also awesome. 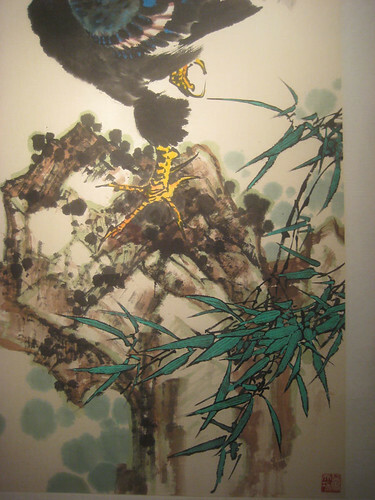 a lot of his stuff features 2 birds on the branches. 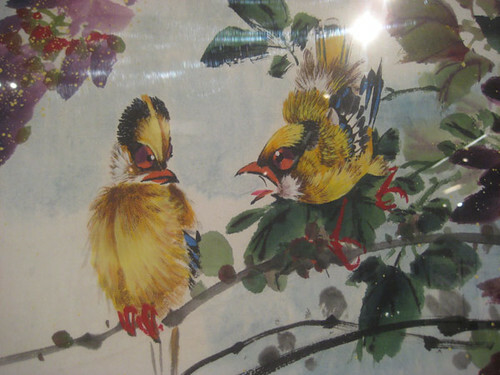 there is probably an extremely poetic and beautiful reason why its always two birds. as we were walking through Zizzo was saying that every painting had a beautiful title that really hits the heart. 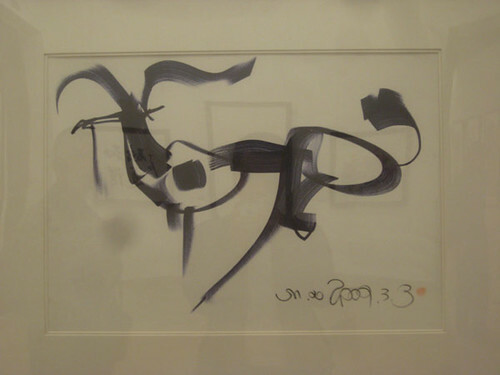 this is a time when i wish i had a full grasp of the chinese language because if the names of the paintings alone can move Zizzo, who i don't take as an arty guy at all, then it would probably knock me out! 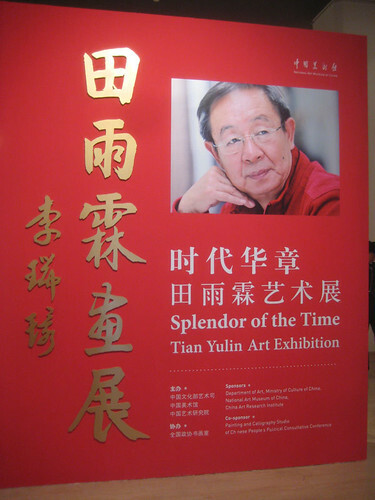 this is not part of the exhibition. everything in these rooms looked of lesser quality and def not done by "masters", yet there were still some cool things. this thing seriusly looks like it was made with one of those fat magic markers but its still awesome and looks very illustrative. 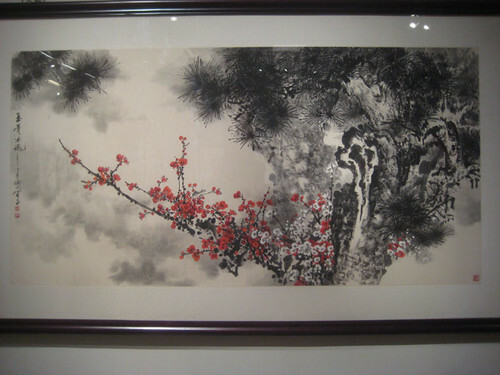 so in conclusion the china national gallery is awesome again and if you like art then you should def come here. Debbie and Salih were are def going here when you come! 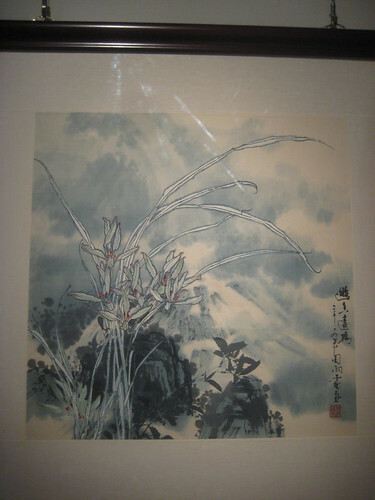 another note is that i feel like Chinese and Japanese people have a better appreciation for art, especially their countries art than Americans have. 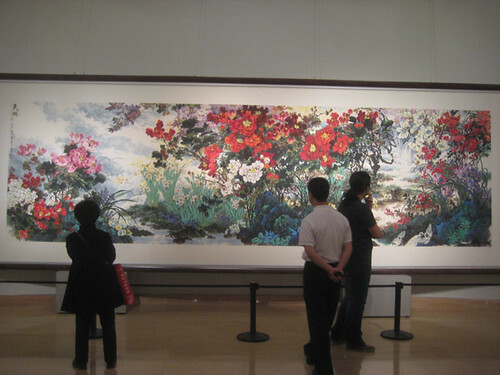 i guess it doesn't help that American art is all over the place due to our history but still it seems like Chinese and Japanese people have a deeper appreciation. good job guys.